Finally back to work on the trailer! Joe is now rather sick with what I had. The worst thing about this illness is that it creates a terrible headache that is quite debilitating. But on a positive note, he also had his last day of work today. 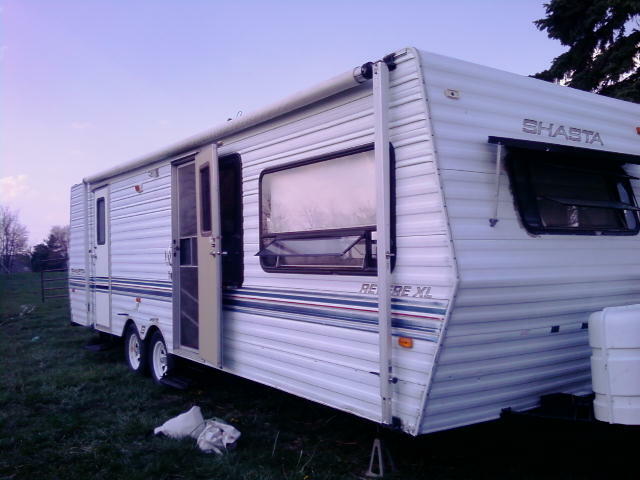 Now we can fully focus on getting our trailer finished and us moved out of our house. I have been working hard on finishing up the repairs. I got the hole covered and painted the cabinets. I still have some trim work to finish on the wall repair. Joe and I bought some really wonderful fabric that will cover the valances and part of the dinette seating. I think it is going to look so nice when we are done. Pictures will be comeing soon! The garage sale has been postponed due to all of the sickness in our family. Last Wednesday, the 21st, I started getting sick. Some of my kids were already sick, but I only had a mild sore throat at that time. So by Thursday night, I was down for the count. We had worked on the trailer a little on Thursday afternoon, but as soon as the sun went behind a cloud, I started getting cold. Then the cold turned into chills. Then came the aches and pains. I am only just now recovering and so is my family. In all my years with children this is the most sick my family has been as a whole. Everyone has been affected. Even little Nehemiah. This has put us quite behind on the repair of the RV and preparations to move. But I know that with God’s grace we will pull through. I am still taking it fairly easy. Today will most likely just be a catch-up-the-laundry day. OK, I think I am now the most fickle female. After prayer this morning and some time alone with God, I have decided that we should keep our trailer even with the flaws. It may not be perfect, but it is ours. I do think that God has blessed us with it. And there is one major perk of fixing the problem areas…it makes it personal. I actually love fixing up things. It totally excites me to renovate things. So I am really glad that I can work on this project and make the trailer a personal home for us. So really this is a blessing. God has a sense of humor, I guess. And He knows me better than I know myself. I think my emotions are a little out of wack. So anyway, we have gutted the dinnette area, taken out the old microwave, adjusted the fridge, taken off a lot of gold trim, fixed some window seals, and some other minor stuff. I think this is going to turn out good. I’ll try to keep it updated on here as to what all we do and what problems come up. Praise God for new days and new attitudes! I am trying to write on this blog every day. I didn’t realize how hard this would be. Life right now is about as bad as I would dare to imagine. The shining light in all of it is that I have a husband who loves me inspite of my failures and doubts. And I have God. Without those two, I would be a horrendous mess. Actually with those two, I still am a horrendous mess. It appears that our trailer is not going to work out. I discovered a huge hole in the wall under some padded upholstery that was put there to cover it up. I had to take the padding down because it made the dinnette table unstable. I am so discouraged. But I know God has a plan. So on top of the “mule kick” from the other day, I now have a trailer that won’t work for us and I no longer have the money we had saved. Please pray that the trailer sells. And pray for healing in my family…physically and emotionally. It has been one of those days when it feels like a mule has kicked you in the teeth. Emotions that mean nothing stream and scream through me. Yet, they are useless. Everything is Christ and Christ is everything. And I am nothing. This word keeps being forced into my consciousness. About a million times a day, I worry about whether our moving into an RV is going to work out. Then I say, “Trust. Just trust in Jesus.” There are so many, many details to work out in getting a family of ten to fit into a 29 foot trailer. We also have other issues that have to be solved too. For example, we have 3 dogs, a cat, 4 lizards, 2 snakes, and many chickens. It is interesting to note that several of the things that I have started to worry about have already just worked themselves out. The very fact that we now own a great truck and trailer when we originally had no money for either is a miracle. So if God can give us a new home when we had literally nothing, I know that He can figure out how to fit our animals into our trailer or give them new homes. And I know He can figure out how I am going to cook with an oven that would only hold about half of one of my cookie sheets. And He can figure out where we will store shoes, jackets, and swimsuits for ten people. God has a plan. I just need to trust that He will take care of the details. Trust. After years of praying and waiting and saving, we have finally bought an RV. It is a 29 foot ’91 Shasta Revere XL. We have looked at hundreds of RVs. And this one seemed like the right fit for our family. We are so thrilled and a bit in shock. Emotions are running high for everyone. The next step is to clean it up and start packing it up. Easier said than done! But I trust that God will take care of all the logistics. He has taken care of everything else why would He stop now?